While we are in the midst of running our café for the summer, I have fallen into a pattern of reporting what is called a Solar Forecast each morning on my business facebook page. I thought of the idea from the title of a children’s book called: Cloudy with a Chance of Meatballs. It is a playful way to share our our featured wraps, rice plates, and soups. The “weather” sometimes reflects the real weather and often describes other things that are going on in our space. I think both definitions fit our garden. 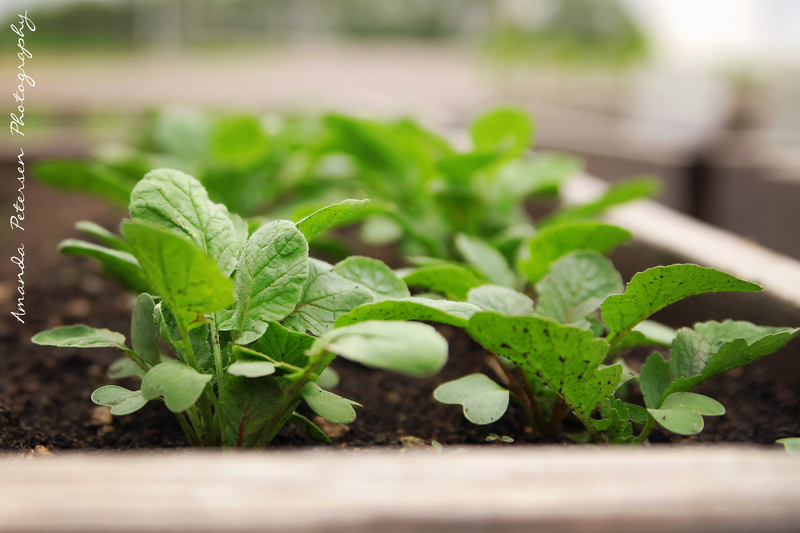 It is green with growing plants and I am unripe in experience or judgment when it comes to growing things. Luckily I don’t do the soil amendments and planting. I leave that to my husband who studied soil science and agronomy. So far this year my job has been to pick berries, peas, and beans. I do it in the cool of morning while my amateur agronomist is inside sheeting dough for our wraps. But even then, I am not sure when to pick things. Does anyone know when green beans done? 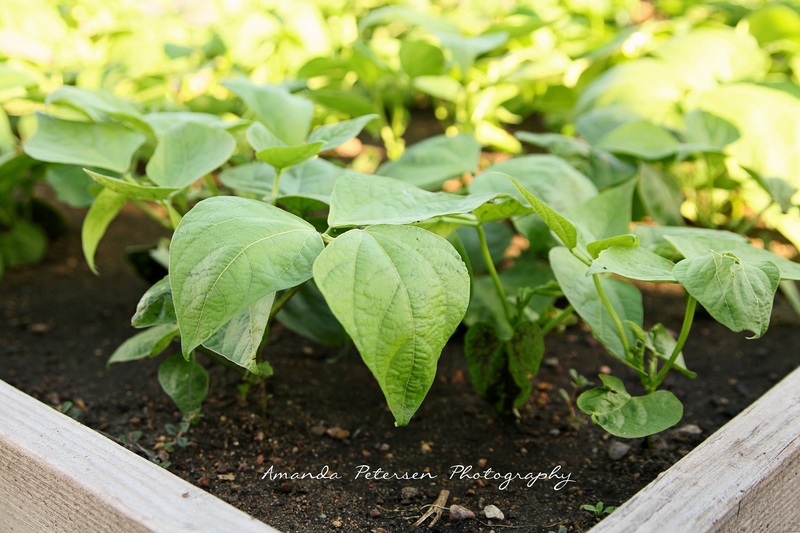 It is time again to share our garden updates like we did last summer. Luke took photographs in Late May 2012, Late June 2012, Late July 2013, and Late August 2012. 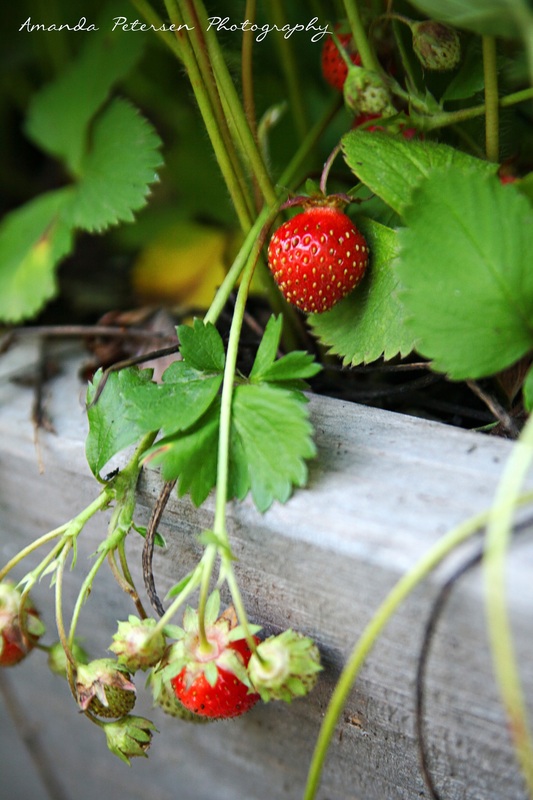 Living in a northern landscape like Minnesota makes one truly celebrate the growing season. 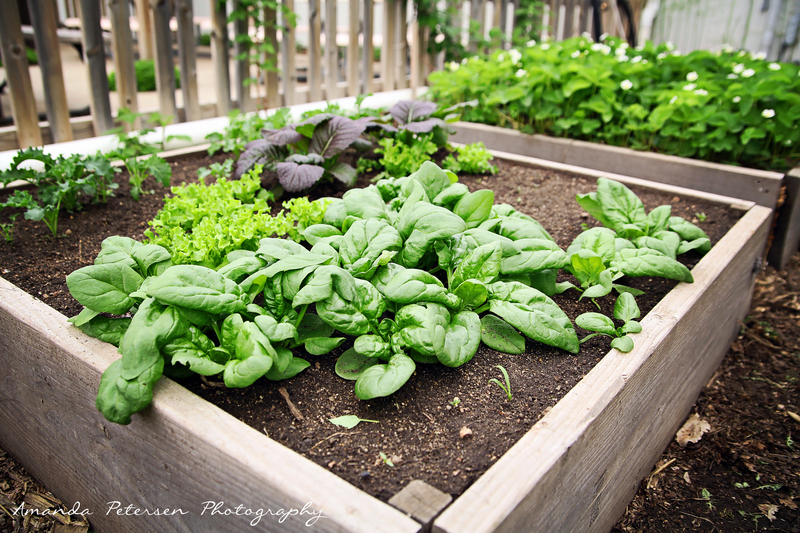 As a reminder, Steve built raised beds outside our restaurant building during the summer of 2011. 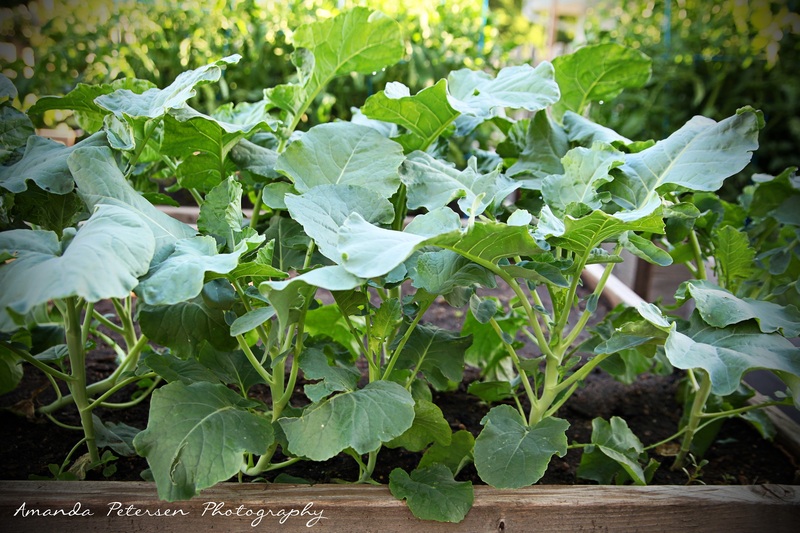 We utilize our garden for what we call FarmerChef specials. Since Luke moved to Los Angeles earlier this year, we have been working with Amanda Petersen Photography. We love the images Amanda has captured of our space. You will know if a photo comes from her work if you see her signature….we will be using many shots in our blog. 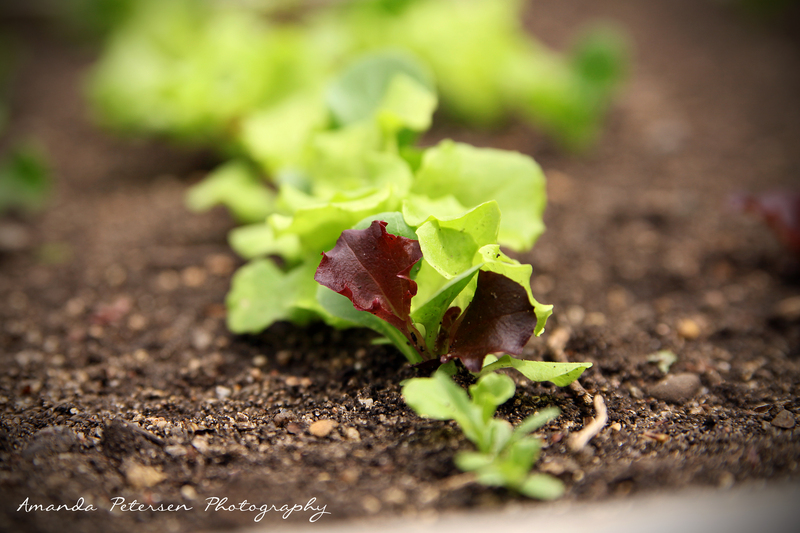 Our little lettuce plants get going during our cool month of May. 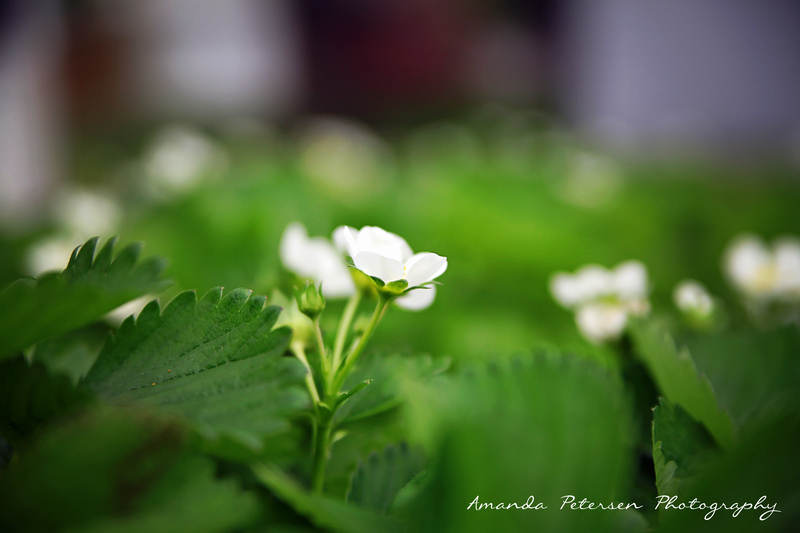 The strawberry blossoms are a good sign if we hope to have delicate sweet berries in June. 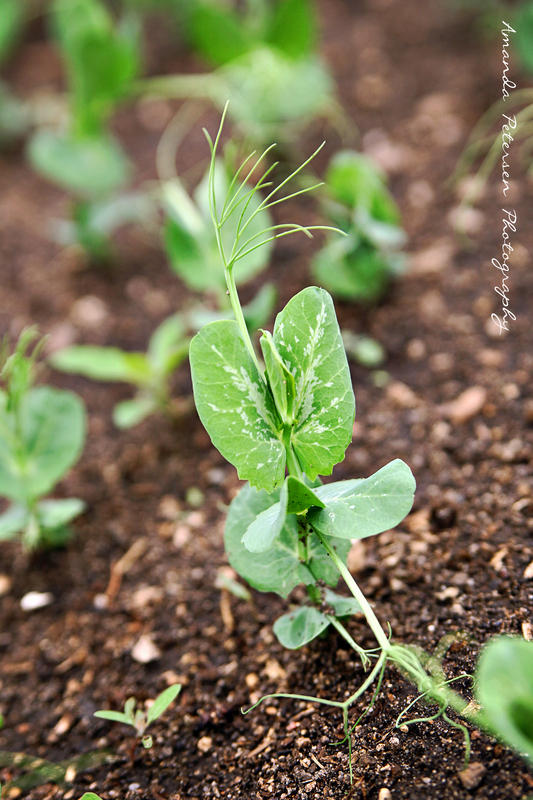 Eager little pea plants establishing themselves and claiming their space. 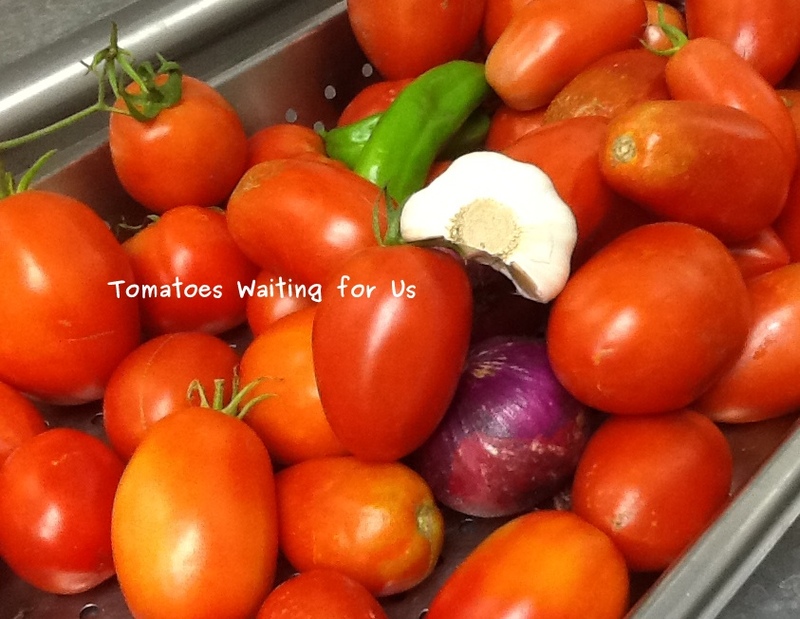 We look forward to crisp radishes soon! 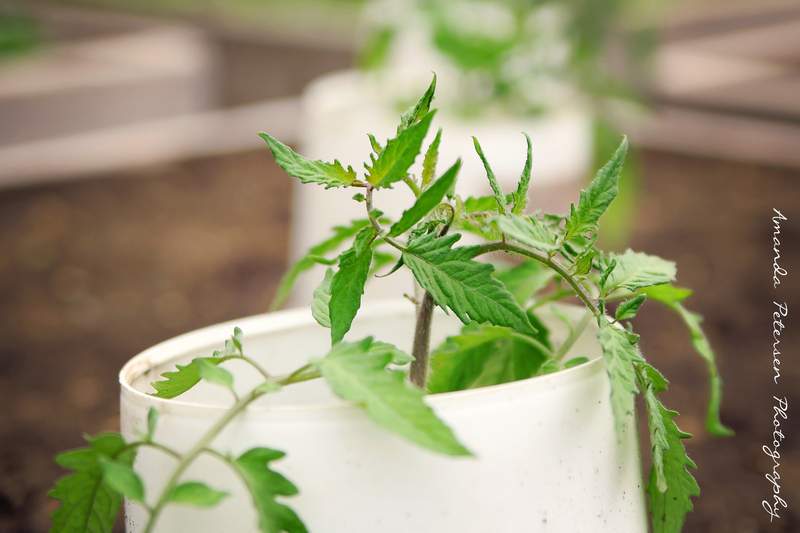 How big will our tomatoes grow this year? Prior to our trip to the UK last November, I briefly connected with The Intolerant Gourmet, author and blogger, Pippa Kendrick via twitter. She offered suggestions on several places in London that work well for people with food allergies or food intolerance. 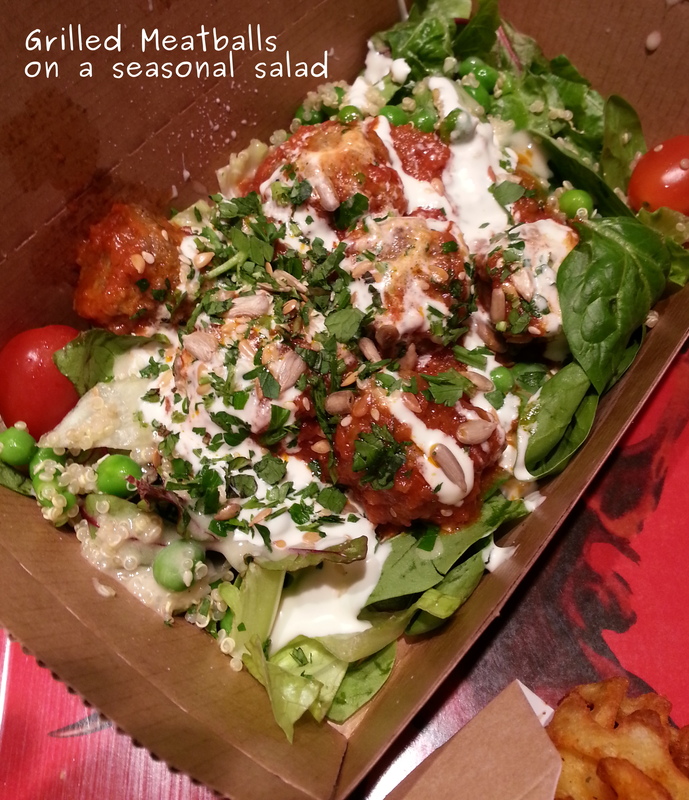 One particular restaurant called Leon looked interesting to us because they do quick service food in a way that incorporates good ingredients and tasty food. That caught our attention because we were hoping to adapt the menu of our new restaurant to better meet the needs of people on a variety of diets. The food was fresh and flavorful and the service was quick. 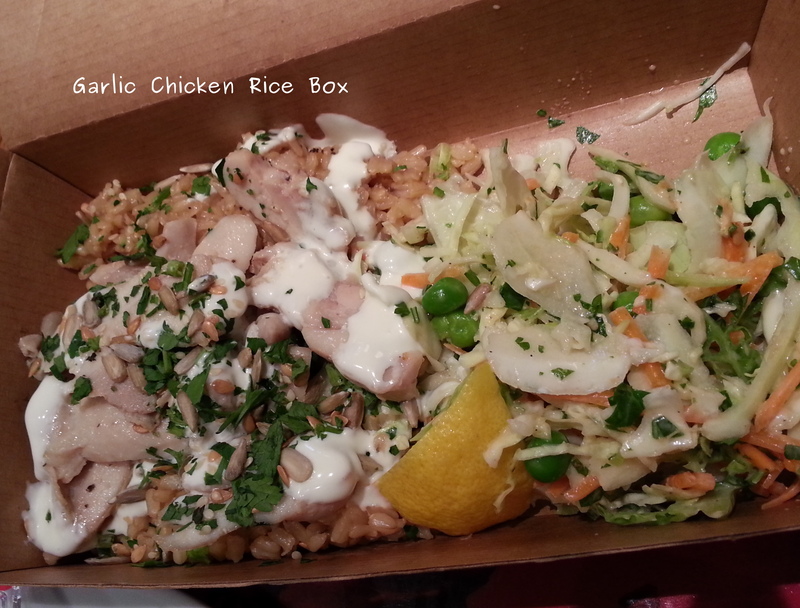 Back in our little restaurant we have added our own version of the rice box. We call it the Flavor of the Day Rice Plate. The response has been surprisingly good. Whenever I take a rice plate out to the dining room heads turn and people ask to know more about the dish. 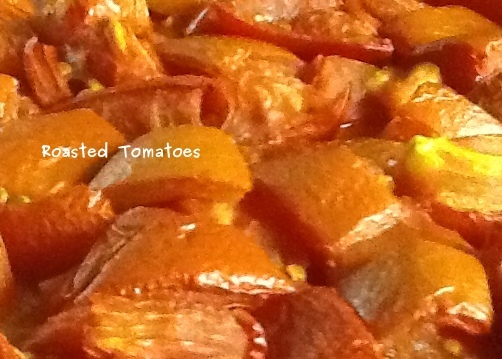 Real food is….food prepared in a kitchen using simple culinary skills and whole food ingredients. 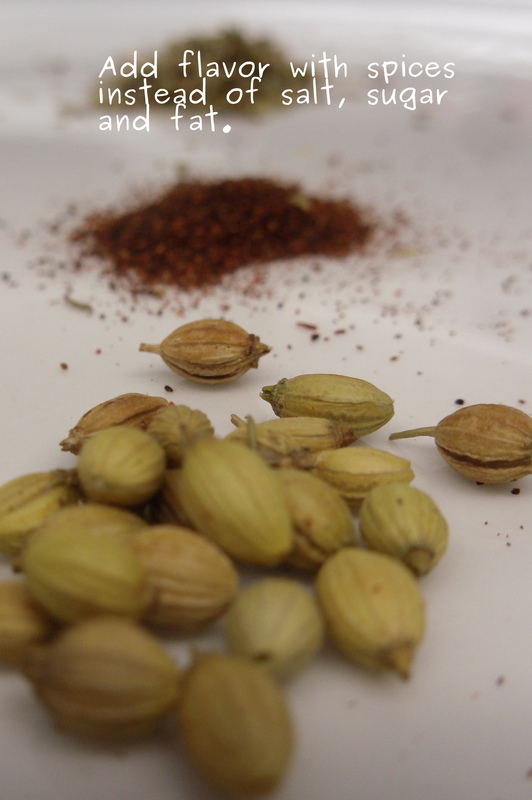 For flavor, real food utilizes dried spices or fresh herbs instead of added salt, sugar, and fat. In our last post we asked how you define real food. We didn’t get much conversation going, but a lot of views on the blog. While the definition may change as we venture into the world of real food, we are starting small by making a distinction between food that is prepared vs. food that is processed. Processed food is …. a food-like substance engineered in a lab, prepared in a factory and re-heated or combined with other ingredients in a restaurant or home kitchen. Processed food became a larger part of our collective lives during the 20th century. Now in the 21st century, processed food is under increased scrutiny for health concerns. Last week Salt Sugar Fat: How the Food Giants Hooked Us was published by author Michael Moss. The book tells the fascinating story about the business of selling food. If you don’t have time to read the whole book you can read this excerpt called The Extraordinary Science of Addictive Junk Food. Most food companies are doing what businesses do: maximize profits by meeting customer’s needs. Unless they are a smaller food company with a distinct mission, they are probably not set up to give us healthy food choices, those choices are for individual consumers sort out for themselves. Like most people, I didn’t pay much attention to all this processed food. In fact I remember when Oscar Mayer came out with Lunchables. I actually got excited about the ease of use and bought them for special treats. According the the excerpt from the book, many of us have been buying food that has been engineered to taste good, convenient, and as affordable as possible. As a result, we have become addicted to these food choices. That is really good for food companies and their shareholders but maybe not so good for us in the long run when it comes to our health. When enough people want something different, the food companies will scramble to change so they can continue to make money. However because of the addictive nature of processed foods, change is really hard. I know I have felt overwhelmed by the ubiquity of processed foods in our busy lives and cravings for tasty convenient food. Confession time…as I write this, I am nibbling on empty sugar calories. This summer our business will run a mostly real food cafe. We hope people discover that real food can taste good. Our new menu will feature both real food and processed food on the menu. When meeting the needs of people with allergies and food intolerance, and those on special diets, real food with simple ingredients, makes it easier for people to determine what to order. As an example, a person could order chicken strips and fries…a fairly traditional fast processed food or a Southwest Rice Plate which is less processed and prepared in our kitchen. The ingredients for the rice plate will be listed on the menu and include things you might find in your own kitchen. The ingredients on the bag of the chicken strips is not as easy to understand but we do make it available for those that ask. In the summer, when the farmers market returns and our garden is producing, we will also feature FarmerChef specials like we did last year. Change is slow but because we are starting to want these kind of choices when we eat out and travel, we want to provide them to our customers. How about you, do you look for restaurants that offer more real food options? Tags: junk food addictive, personal choices, real food, real food vs. processed food, restaurant re-purposing, Salt Sugar Fat, small mission focused food company, what is real food? Who the heck is solar? Solar Drive-In was the name of our family’s first restaurant . We originally named the restaurant Solar because we installed solar panels. We had really good luck in the restaurant business. 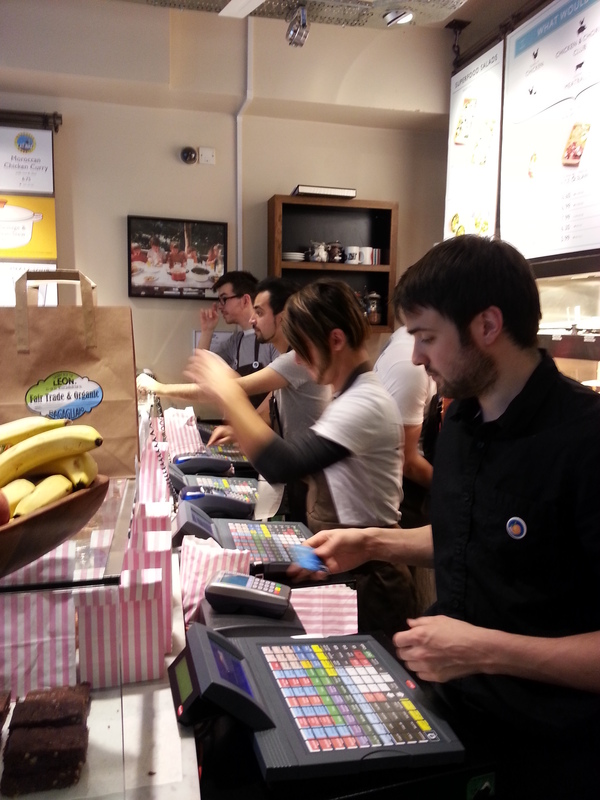 The food tasted wonderful, the customers supported us immensely, and the employees where bright-eyed. 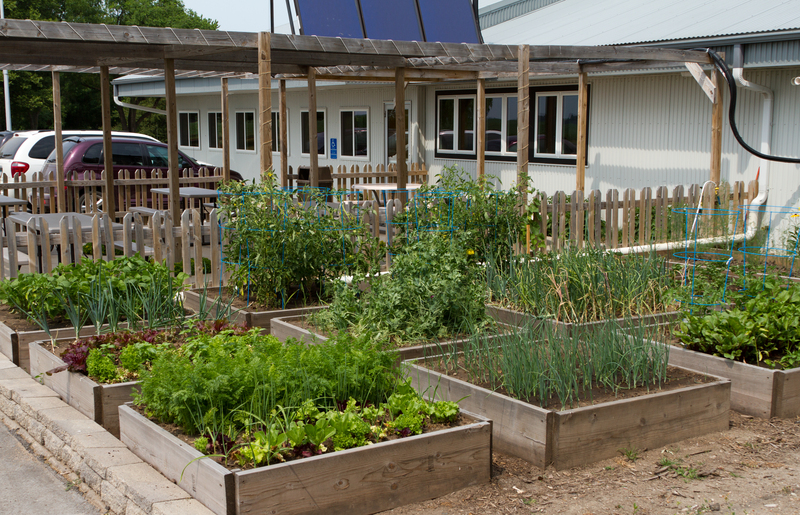 Following our passions, we planted a raised bed garden outside our building and the food grew really well with just a few challenges. This beginners luck soon began to take on the name “Solar Magic.” With all of that going for us you can see why we would want to hang on to the name solar. As for real food, we could say a lot. But before we explain our own perspective. It would be great to know what others think? Perhaps it needs no definition, perhaps we all intuitively know. 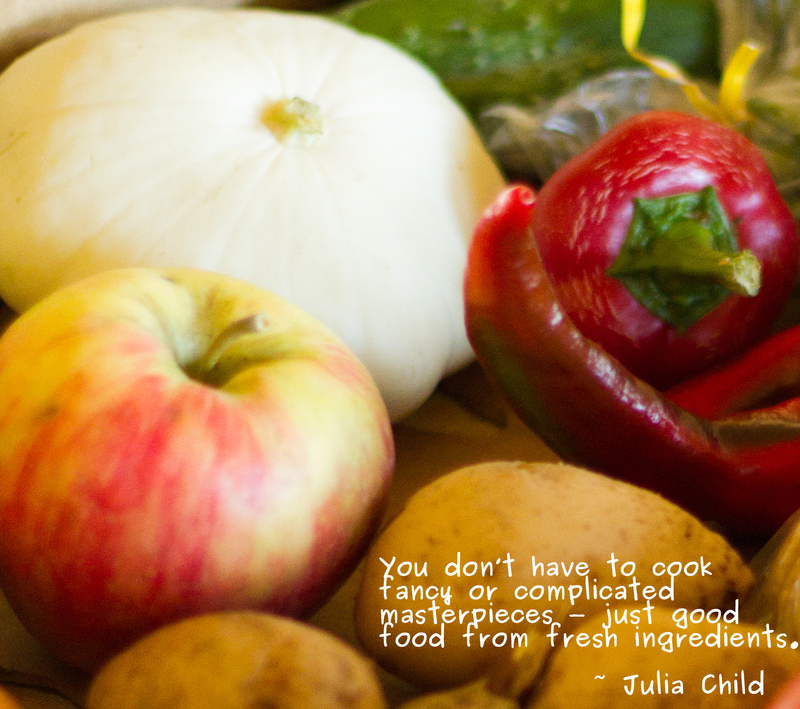 Here is a quote by spunky Julia Child to help us ponder the question: What is real food? Tags: business decisions, julia child quote, real food, restaurant re-purposing, solar panels, what is real food? In the spirit of our summer-long monthly garden tours, I took a picture the other morning that says a lot about the state of our garden. Today, Steve decided to bring all the tomatoes inside. 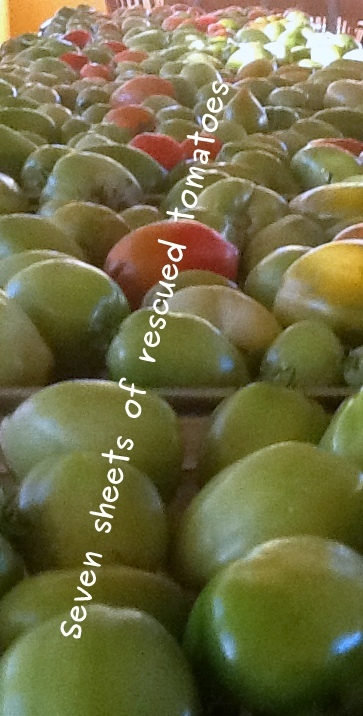 Now we have seven baking sheets of tomatoes spread out in various stages of ripeness. Last year green tomato time didn’t happen until the end of the month. Hmm…I wonder if I should make Rescue Me Pie again this year? Or how about muffins with green tomatoes? Hmmm….I think I remember Francine mentioning that she made a Green Tomato Soup. How is your garden doing? Do you have any green tomatoes? Like most gardeners who travel in late summer, we returned home to the reality of lots and lots of tomatoes. 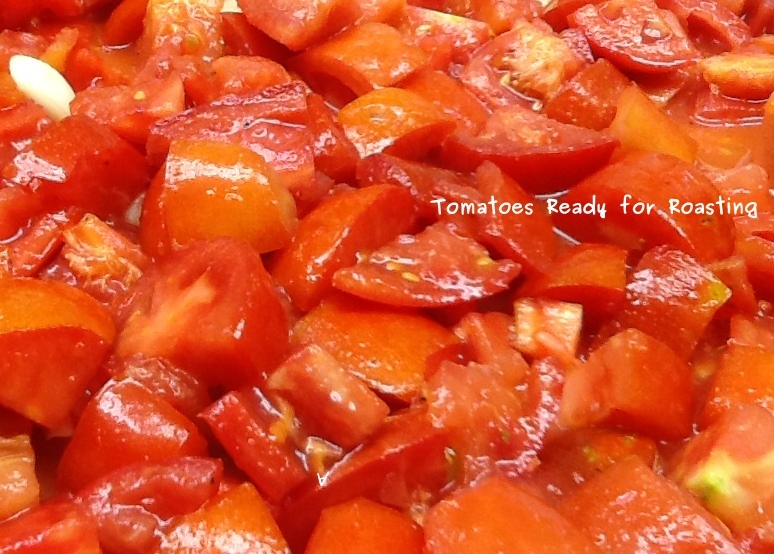 Thanks to my in-laws, the tomatoes were already picked and ready to be processed. 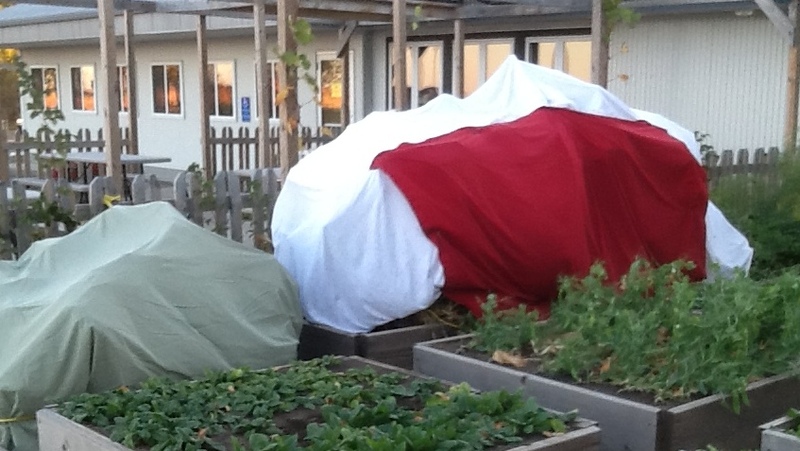 They where even so kind as to cover our raised beds for a few chilly Minnesota nights while we were away. Here is what we found in our commercial kitchen’s walk-in cooler. My mother in-law shared an idea from a blog called Squash House Quilts. Check out the original post with beautiful pictures. Hmm….what should I make with my sauce? Follow our eating and learning adventures by signing up for email notification of new posts.